The mud-packed walls of the Mazimpaka's family room show the strong influence of young people: Hanging among the rosaries and pictures of St. Mary are posters of Miss Rwanda, the Rwandan singer Christopher, and the Rwandan boy band Dreamboyz. The room's only window shines a square of light on one of the adorned walls, and on a wooden table and bench. 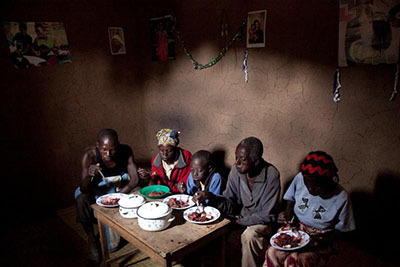 A family in Gisheke village, Rwanda, eats a nutritious lunch thanks to the vegetable garden they've learned to grow in a CRS project to help coffee farmers. Photo by Laura Elizabeth Pohl for CRS. This is the room where Dominque Mazimpaka, his wife, Dorothée Iyakaremye, and their four children eat meals and entertain guests. They would love for their walls to be covered in clean, smooth cement someday. In fact, Dominique and Dorothée dream of cement for the dirt floors, too, doors for all of the rooms, and a ceiling for their home. The couple thinks they can make those things happen by the end of 2015, partly because of what Dominique has learned in a coffee farmers' cooperative he joined 2 years ago. Among other lessons, he's learned that organic manure from his cow and pig can increase productivity on his 2.47-acre coffee farm and in his home gardens. 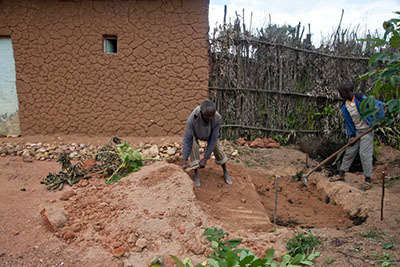 He's also learned how to dig to improve soil fertility, and that he should cover coffee tree roots with felled tree branches to prevent drying and improve productivity. Following these steps has helped Dominique increase his yearly coffee bean yield from 11 pounds to 44 pounds. "I want to improve my life and grow better as a coffee grower," Dominique says, sitting in his family room. Catholic Relief Services, with funding from Keurig Green Mountain and help from Caritas Gikongoro, helps small-scale coffee growers in Rwanda ensure they can provide for their families, even when the coffee business is not thriving. The initiative will have helped 3,600 households improve their living standards by the time the program ends in May 2015. The farmers receive agriculture, nutrition and health education; participate in savings and lending activities; and receive vouchers to buy an animal at a livestock fair. Recently, Dominique and his son Innocent, 13 were digging a new garden before Innocent's afternoon classes. They used the double-dug bed technique. They dig about 12 inches down, set aside the topsoil, and loosen the exposed soil to create good conditions for roots to grow. Then they add layers of manure and compost—tree branches and leaves—before covering the garden with the topsoil. Dominique plans to grow carrots or cabbage in the new garden. His family rarely ate either of these vegetables before joining the farm group and learning about how a balanced diet promotes nutrition. Their meals used to consist mostly of beans and potatoes. Now, in addition to carrots and cabbage, they eat amaranth and sometimes, avocados. Dominique Mazimpaka prepares lunch. 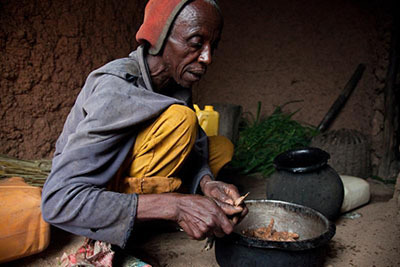 Before joining the Keurig Green Mountain-CRS program for coffee growers, his family ate only beans and potatoes. Now they eat other vegetables and can afford cooking oil too. Photo by Laura Elizabeth Pohl for CRS. "Before, we ate what we knew; we didn't eat vegetables or protein," says Dorothée. "The project changed our mind." After digging the garden, the family sits down for a midday meal of beans, potatoes and amaranth. The three older children are already out, but Dominique's brother and sister, who live nearby, join the rest of the family. The square window in the family room illuminates everyone as they silently eat at the wooden table. The Rwandan singer Christopher, Miss Rwanda and St. Mary watch over them from the mud-packed wall that they see as cement one day soon.